U.S. prisons could outlaw weight rooms, but they couldn't stop prisoners from finding ways to bulk up. These five exercises form a never-before-published, highly-effective bodyweight training routine that'll show you how to get swole in a "weight-less" environment. From Jean Valjean of "Les Miserables" to Mike Tyson, history is filled with stories of men coming out of the clink bigger, badder, and broader. But, society doesn't exactly celebrate men who undergo these transformations. In fact, the California Penal System completely banned weights from correctional facilities in 1992, with most state prison systems following soon after. Within a few years, jailhouse "weight piles" were a thing of the fabled past in the United States. You might think these bans curtailed the era of jailhouse hypertrophy, but nothing could be further from the truth! Today's inmates are bigger, leaner, and harder, even with the less-than-wholesome foods they are fed. They do it by using the one weight nobody can take away, their body weight. Some prisoners say that when you're behind bars, you watch to see who rises to be a predator and who is left as prey. In that environment, they say, you either get big or die. With no weights available, prisoners have developed highly effective and extensive bodyweight-only bodybuilding methods to build functional hypertrophy. In our book "Jailhouse Strong," Adam benShea and I extensively describe these methods. In this article, we build on these methods and reveal a never-before-published, highly-effective training routine aimed at building muscle hypertrophy and strength endurance with your body weight alone. Do this workout 1-2 days a week along with your existing strength-training routine. You can add it to your existing workout because it's much easier to recover from bodyweight training than traditional resistance training. The session begins with the Juarez Valley Method, which has already been featured on Bodybuilding.com. Since then, my colleague and cruel genius JP Mikhael, had the idea of combining this methodology with two exercises! You'll perform the Juarez Valley 15 as a superset, alternating in a specific pattern between the push-ups and the burpees. Begin by performing 15 diamond push-ups. Perform one less push-up (14), and then one more burpee (2). Repeat this "one-less, one-more" pattern until you reach eight push-ups, followed by seven burpees. If you don't want to commit to the entire "Get Jacked" workout, use the Juarez Valley 15 as a finisher on chest day. Besides driving your heartrate through the roof, it'll give your chest and triceps a skin-splitting pump. A lunge is a functional movement that duplicates the mechanics of a wrestling takedown, making you ready for a violent encounter at the gas station at 3 a.m.—or a more peaceful one in the bedroom. Doing them Tabata style means performing them at maximum energy for 20 seconds, resting for 10 seconds, and then repeating this perform/rest sequence for a total of 4 minutes. Go as fast as you can while maintaining good form. Begin standing with your feet shoulder-width apart and your hands on your hips. Step forward with one leg, flexing the knees to drop your hips. Descend until your rear knee nearly touches the ground. Your posture should remain upright, and your front knee should stay above the front foot. Drive through the heel of your lead foot and extend both knees to raise yourself back up. Step forward with your rear foot, repeating the lunge with the opposite leg. This exercise follows the same superset format as the Juarez Valley 15, except now you're hammering your thighs—and adding 5 more reps when you're already fatigued. Begin by performing 20 bodyweight squats. Perform one less bodyweight squat (19), and then one more jump squat (2). Repeat this "one-less, one-more" pattern until you do 11 bodyweight squats, followed by 10 jump squats. In the weight room, a well-developed neck separates the bar benders from the pretenders. In a hostile situation (aka a longshoreman dive bar, prison yard, or meeting a potential father-in-law), the dead giveaway between muscle function and fashion is a well-developed neck. You can hide almost any physical shortcomings with the right wardrobe, but not the neck. If your neck looks more like a stack of dimes than the trunk of a cedar tree, the only solution is real development. You don't need fancy equipment or even a gym membership to build your neck. All you need are head nods, a fundamental training technique that evolved out of some of Brazil's toughest favelas (ghettos). Lie on your back. Lift your head and bring your chin to your chest for a set of 10 repetitions. Keep your head off the ground and look to your left for a set of 10. Repeat to the right. Keeping your head raised off the ground, touch your left ear to your left shoulder for 10 repetitions. Repeat to your right. The bad news is that your neck will be screaming as you do these small movements. The good news is that you can do head nods while lying in bed! If all you've got are some well-developed guns, you're still vulnerable to predators. As part of an overall package though—including a strong back—bulging biceps can't hurt. The inverted row is a popular biceps-and-back development exercise because of its beautiful simplicity and brutal effectiveness. All you need to do is find a bar that runs parallel to the ground and is 3-4 feet off the ground. This could be anything from a handrail to something at a playground or a rack in the gym. 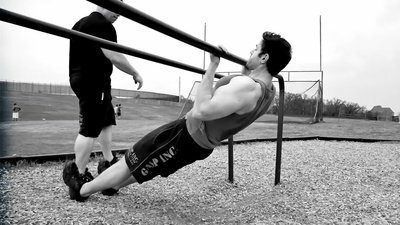 Grab the bar with a shoulder-width supinated (underhand) grip and position yourself so that you're hanging underneath the bar. Your body should be straight with your heels on the ground and your arms fully extended. This will be your starting position. Keeping your forearms and elbows as still as possible, use your biceps to pull your chin toward the bar. Pull yourself as close to the bar as possible. Perform as many reps as you can until you hit failure, rest 15 seconds, then keep going. Your goal is to perform 100 repetitions with as few rests as possible. Bodyweight training has made a comeback because of its simplicity and effectiveness. After all, all you need is you. With the weight of your body alone, you can build muscle and torch body fat while improving your conditioning. To progress through these "weight-less" workouts, keep track of how long it takes to complete each exercise and to complete the entire workout. Strive to continually beat these times without degrading your technique. Post your times in the comments section below so we can track overall data and help others set goals.